Hello everyone, my name is Bora Nalbant and I am turning 19 in a few weeks. I study Office-Management at Kta-Zavelenberg in Belgium. I am from Turkey, but I was born in Belgium and grew up there. Belgium is a little country but also really beautiful, I like the way of living in Belgium and I have to admit it, I miss Belgium a lot! I flew to Sicily to spend a three-week internship with my school and another school from Brussels. It is a big opportunity for us to have this three-week internship abroad. We can learn a lot here for our professional life, I learnt a little bit of administration here and how to work with Publisher! Already from the plane I could see Sicily waiting for us. We had a flight with a stopover but as soon as we arrived at Catania airport, we could feel the Sicilian spirit! We arrived late but although it was late in the evening the whole city was still wake. After being checked-in at the hotel, the tiredness did not yet surround me, so I went out to do a little walk around the hotel with friends. The hotel is so pretty inside and outside that you would like to come here. The next day we went out for a walk to visit the neighbourhood of our hotel and to know where the little stores are, Sunday or not, lots of them were open but till a specific time. They do have a siesta here and most of the shops close at one o’clock till four in the afternoon. Then the shops open again from four till eight in the evening. It’s kind of disturbing for people that live somewhere, where they don’t have the Siesta. But we got used to it now. What about the job? Well every one of us got placed according to their training, informatics in computer software and information companies; secretaries at hotels for the reception and I have here one of the best workplaces if I can say so. I work with EprojectConsult, I have my own office, and everyone speaks English here, some of them even French. 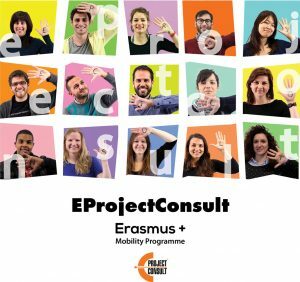 EProjectConsult has a broad experience in organizing and leading European Projects, in the context of the Erasmus + Programme, EProjectConsult welcomes participants from European countries as a host or intermediary partner. What about food and cars? Food is here really delicious especially pizza! They can cook very well. Here in Sicily many of them have very old cars, like old Suzuki’s or Fiats, old but gold, right? For someone like me that likes old cars, likes to discover etc. The street of Barcellona P.G is the place to go. Here they can drive without being angry as I have seen since now, they drive very fluently even if sometimes it is not easy in town to drive with all those kinds of cars. “I will let you know how it will be for the upcoming 2 weeks!